Mission for the Rural People is an orphanage for 120 children in a very rural part of Andhra Pradesh, India. When my parents and I visited in 2012 I loved the orphanage and the children so much. They have very little but are immensely happy. Although they well cared for they are still struggling to find enough space to feed and house all the children. As you can see currently they have to eat outside on the ground. This is not too bad when the weather is good, but when it rains they move into their church which leaks and gets quite wet. 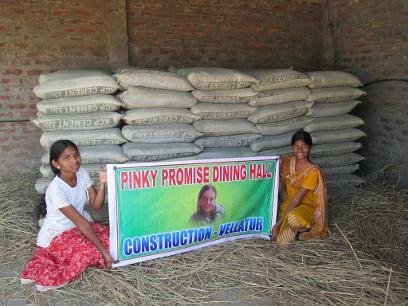 I have committed to raise $17,000 to fund construction of a new dining hall. To-date I have raised $6,000 including $2,000 of my own savings. They have started construction and laid the foundation. In the photos below the kids are sitting on the completed foundation. I am hoping friends will help me raise the rest. If 100 people will contribute $100 we will have this hall complete in a year. $100 is less than $2 a week. Less than most of us spend on on a trip to Starbucks. Click below to make a donation of $8.50 per month for a year.